Networks and advertisers typically spend every fall focused on the new prime-time lineups. Not this year. All eyes are on late night, and with good reason. "Outside of sports, it's the strongest area of television from an ad-supported perspective," said Chris Geraci, president of national broadcast at OMD. When Jimmy Fallon took over from Jay Leno as host of NBC's Tonight Show in February 2014, his immediate success at 11:30 p.m. "rejuvenated the daypart," said Geraci. This fall, late night has been revitalized yet again, with the arrival last month of The Late Show with Stephen Colbert on CBS and The Daily Show with Trevor Noah on Comedy Central. Those two launches capped a turbulent 19-month period in which every nightly talker with the exception of ABC's Jimmy Kimmel Live welcomed a new host. As the dust settles on the latest late-night moves, advertisers find themselves with a more enticing (and younger-skewing) audience than they've had in years, and they're paying to reach them. According to SQAD NetCosts, which tracked quarterly 30-second ad prices in the adult 18-49 demo, CBS has doubled the rates The Late Show got as David Letterman was winding down his reign. In the fourth quarter, The Tonight Show with Jimmy Fallon led the pack with an average $48,750 ad cost (a 73 percent increase from Jay Leno's final months). The Daily Show with Trevor Noah was second, with $36,890, followed by The Late Show ($29,400), The Nightly Show with Larry Wilmore ($22,000) and Jimmy Kimmel Live ($20,240). Thanks to the smooth transition from Leno to Fallon, The Tonight Show's ad rates began skyrocketing when 2014 upfront sales kicked in late last year. As TV becomes more fragmented, "late night and the late-night [intellectual property]—the hosts—travel across platforms, so it's become even more popular," said Linda Yaccarino, chairman, ad sales and client partnerships at NBCUniversal. Among The Tonight Show, Late Night With Seth Meyers and Saturday Night Live, "the demand on all three shows is truly insatiable, and I wake up every morning thrilled for the ratings and just wish I had more inventory," said Yaccarino. While NBC has maintained its late-night dominance, CBS has plenty to celebrate since Colbert's arrival Sept. 8. Late Show ad rates have averaged $38,400 since then, double what CBS got last year. The numbers were helped by Colbert's debut, for which ad rates topped $100,000 per spot. "I couldn't believe it was that high, but it certainly got the viewership," said Dan Klar, vp of product development at SQAD. 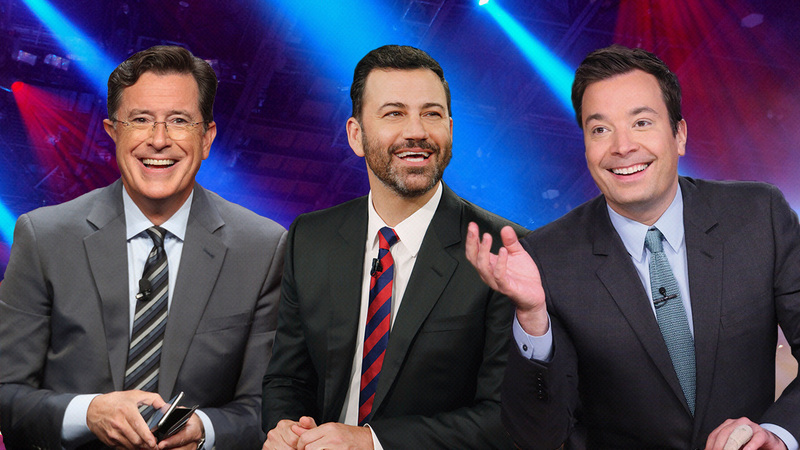 The Late Show premiere drew 6.6 million viewers and a 1.4 rating in 18-49, more than Fallon and Kimmel combined that night and upending the usual order, as Fallon routinely outdid Letterman and Kimmel combined in adults 18-49. While Fallon regained his lead the following night, Colbert is up 60 percent in adults 18-49 (0.8) versus Letterman's final season, and has doubled his predecessor's rating in adults 18-34. "We are so excited and thrilled to be back in this daypart in a major way," said Jo Ann Ross, CBS president of network sales. Added Chris Simon, evp of network sales: "You name a category and we're seeing advertisers that frankly we had not seen in the last five to six years," with the automotive and beverage categories particularly strong. CBS' new late-night clients in the last month include General Electric, Kohl's, PepsiCo, BMW, Pandora, Jose Cuervo and StubHub. Fourth-quarter scatter "is very active," said Simon. "Going back a few years, we would not be seeing these dollars coming our way, nor the increases that we're writing." Beyond the surge in ad rates, NBC and CBS are capitalizing on their hosts' willingness to participate in integrations, as Colbert did with Sabra hummus in his premiere. "That's been a dramatic change for CBS in terms of their ability to work with us, given Letterman's history of not being all that user-friendly," said OMD's Geraci, who worked on the integration. "So the fact that we were able to get Colbert willing to do that in perhaps the most-watched piece of television he had ever done was exciting and is definitely a plus for CBS." Ross said to expect more Late Show integrations this quarter, "probably sometime around Thanksgiving or a little before, if timing goes well." Integrations have also been key for NBC. The Tonight Show's "Fallonventions" integration with GE "is a perfect example of how we are very specifically partnering with certain advertisers and able to expand their investment," said Yaccarino. "If you are able to do it right, and you can integrate advertisers authentically into someone like Jimmy Fallon's voice and then have it travel across platforms, that's really what the advertisers are looking for today." Meanwhile, the newest kid on the late-night block, Daily Show host Noah, is holding his own among his more seasoned peers. Under Jon Stewart, the show frequently led its rivals in ad rates before being overtaken by Fallon last winter. "Obviously, it's come down from what Stewart was, but I thought that advertisers would be more gun-shy, and they really haven't been," said Klar. "[Trevor]'s got big shoes to fill, but so far, so good."